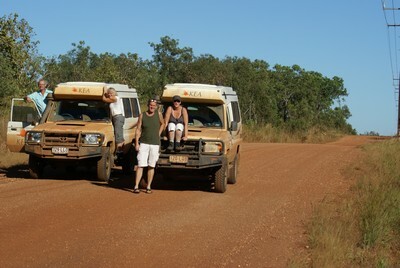 After five weeks throu the Kimberley we are back in Holland again. We had a wonderful time, but also scary moments. We went May 15 on our way to the Mitchell Falls, the roads are just been open. We went the same day to the Mertens Fall and under the falls, it was beautiful. But around five or so it began to rain til the next morning. Around six in the morning a man came to us and say we have to go away, because the roads are closing. And we went. And what a lot of water have we seen and what a bad road, half way we almost make a detour throu the woods, a piece of the road was so bad that we have the go around it. It was scary the whole way back, we needed six hours to come at the and of the road. The way back to Drysdale was better. We made it, now we have a great story to remember. Our holiday that we had planned became a different one, because all the main roads are closed. I want to go to Mornington and Mt Hart, Windjana Gorge and Tunnel Creek, everything flushed to the toilet. Later on we spent one day in the Bungles and then came the rain again. But we had still had a great holliday, with lots of boat trips and helicopter flights. Another thing we have promise to say to you is, we went to Geikie Gorge and there is a new park ranger who is cleaning up the place, a lot of volunteers are helping to get rid of the grass where you are telling about. On the walking paths there is now sand and the walk is great, but much greater is the boat tour, we loved it. We thank you for all the great spots that you told us. We had a great time. Our journey was from Darwin to Katherine, Kununurra, all the places along the Gibb River Road, to Mitchell Falls and then to Derby, and than throu the Great Northern Hwy back to the Bungles and Lake Argyle back to Darwin. It was great, many thanks. Greetings from René and Marjo, Ben and José. Thank you Ben, José, Marjo and René! You have some great photos to go with your great story. Sorry to hear you belonged to the people who got caught out by the unseasonal rain. I am glad that you were able to still enjoy yourself. An adventure to remember for sure! Thanks for letting me know what is happening at Geikie Gorge. Good to hear that the ranger cares about the weeds. It will be interesting to see the changes next time I visit. Was it your group I was speaking to at Cooinda? You were disappointed at not being able to walk another day at Mitchell Falls. 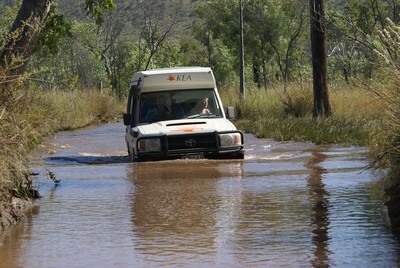 I wondered what type of insurance cover hire vehicles have for travelling the Gibb River Road. Our hire vehicle (2wd) stipulated only 2km or less travel on gravel roads. The paperwork also said something about no travel for 4wd hire (Britz) on Gibb, Bungles, etc. 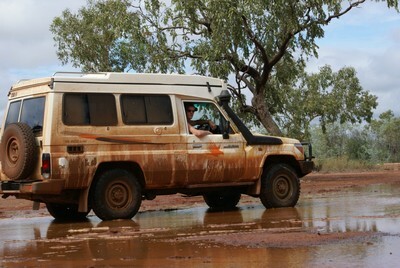 We took an Apollo 4wd camper on a 4 week trip from Broome last year. We took out the full insurance package offered by Apollo (just in case). Apollo have a number of specific areas they will not permit you to travel without their express permission. 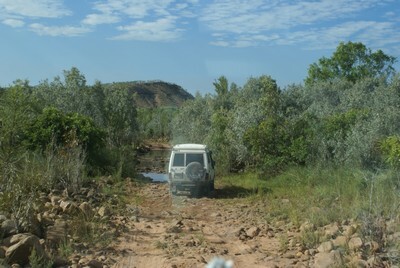 The Gibb River Road is one such area. We left Broome early in the season, the GRR was open and at that time Apollo gave us written permission to travel this route. Also included was the roads to Drysdale, Mitchell Falls, and the Bungles. There was no problem or hassle in obtaining Apollo's permission. Just make sure your contract includes a specific written reference to those areas you want to travel.